Heat oven to 375°. Place paper baking cup in each of 24 regular-size muffin cups. Make cake batter as directed on box. Divide batter evenly among muffin cups. Bake as directed on box for cupcakes. Cool in pans 10 minutes; remove from pans to cooling racks. Cool completely, about 30 minutes. Frost cupcakes with frosting. 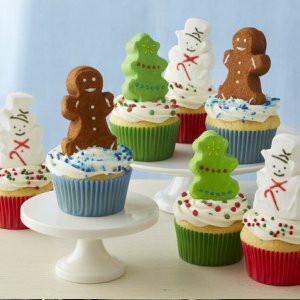 Place Peeps marshmallows on tops of 18 cupcakes; decorate with sprinkles. Decorate remaining 6 cupcakes as desired.